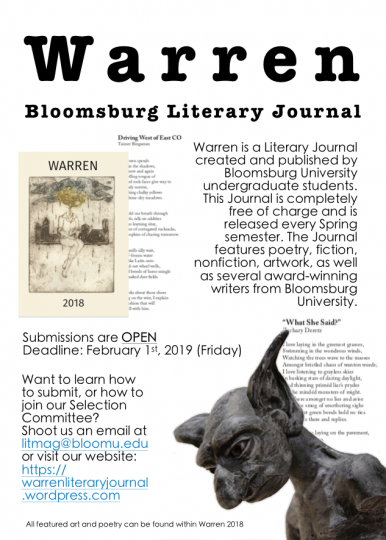 It’s not too late to submit to Warren, Bloomsburg University’s Literary Journal for their Spring 2019 Publication. The deadline to submit work is Friday, Feb. 1st, with an extended deadline of Feb. 3rd. Warren is a student-run literary journal which features poetry, short fiction, creative nonfiction, and artwork. Each Spring semester, the journal is printed and available to the public, free of charge. They also run writing contests throughout the school year, and they feature the winners of these, along with other works, on their website. Narrow is an online extension of Warren also found on their website to feature various works of student writers. If you are interested in submitting work to Warren, email litmag@bloomu.edu. See their flyer below.